Vlorë is the third largest city and a municipality in Albania. It is also the second largest port city of Albania, after Durrës. Geographically, it has a coastline on the northern shore of the Mediterranean Sea, the Adriatic and Ionian Sea, which forms the Bay of Vlorë. Vlorë was founded as an ancient Greek colony in the 6th century BC by the name of Aulon and continuously inhabited for about 26 centuries. It became a bishopric (twice) and remains a Latin Catholic titular see. In modern times, the city was briefly the capital of Albania. It is where the Albanian Declaration of Independence was proclaimed on November 28 in 1912. It is also one of the most cultural and economically significant cities of southwestern Albania. Vlorës is home to Albania's second largest port, the Port of Vlorë. The modern name for the city is the Albanian form Vlorë or Vlora, both pronounced [ˈvlɔɾə], while in the Gheg dialect it is known as Vlonë, Vlona. Vlorë was created in antiquity as a Greek colony in the territory of Illyria. Its first name was Aulón (Greek: Αυλών, also the name in modern Katharevousa), meaning "channel" or "glen" and possibly a translation of another indigenous name. The medieval and modern Greek name is Avlonas (Αυλώνας /av'lonas/, accusative Αυλώνα /av'lona/), and is the source of the Latin Aulona, Italian name Valona (also used in other languages) and of the obsolete English Avlona. During the Ottoman era the city of Vlorë was known in Turkish as Avlonya. Vlorë, one of the oldest cities in Albania; was founded by Ancient Greeks in the 6th century BC and named Aulōn, one of several colonies on the Illyrian coast, mentioned for the first time by Ptolemy (Geographia, III, xii, 2). Other geographical documents, such as Peutinger's "Tabula" and the "Synecdemus" of Hierocles, also mention it. The city was an important port of the Roman Empire, when it was part of Epirus Nova. Avlona became an episcopal see in the 5th century. Among the known bishops are Nazarius, in 458, and Soter, in 553 (Daniele Farlati, Illyricum sacrum, VII, 397–401). The diocese at that time belonged to the (always Latin Catholic) papal Patriarchate of Rome. In 733 it was annexed, with all eastern Illyricum, to the (post-Schism Orthodox) Ecumenical Patriarchate of Constantinople, and yet it is not mentioned in any Notitiae episcopatuum of that Church. The bishopric had probably been suppressed, for, though the Bulgarians had been in possession of this country for some time, Avlona is not mentioned in the "Notitiae episcopatuum" of the Bulgarian Patriarchate of Achrida (at Ochrid). Aulon, no longer being a residential bishopric, is today listed by the Catholic Church as a titular see, a suffragan of Durrës (Durazzo, in Croatia, Metropolitan of Epirus Nova province), being distinguished from a Greek titular see called Aulon by the use for it of the adjective Aulonitanus, while the adjective regarding the Aulon in Euboea (Ionian Greece) is Aulonensis. The diocese was nominally restored as Latin titular bishopric Aulon, or Valona in Curiate Italian; from 1925 it was (als) named Aulona in Latin and/or Italian, since 1933 it's only Aulon in Latin, Aulona in Italian. It was a bishopric (see below) from the fifth century until the Bulgarian rule. Vlorë played a central role in the conflicts during the 11th and 12th centuries between the Latin Norman Kingdom of Sicily, which established a Latin bishopric, and the Byzantine Empire. After it was captured by the Ottoman Empire in 1417, it became a sanjak centre in Rumeli Eyaleti as Avlonya; and after coming under Venetian possession in 1690, the city was restored to the Turks in 1691, becoming a kaza of the sanjak of Berat in the vilayet (province) of Janina. The city had about 10,000 inhabitants; there was a Catholic parish, which belonged to the Roman Catholic Archdiocese of Durrës. In the 16th century, it was an important center for Sephardic Jewish refugees from Spain and Portugal. During the early period of Ottoman rule, Vlorë became an international port centered on a high volume of trade between western Europe and the Ottoman state. In 1851 it suffered severely from an earthquake. Ismail Qemali declared Albania's independence in Vlorë on November 28, 1912, during the First Balkan War. The city became Albania's first capital following its independence, but was invaded by Italy in 1914, during World War I. 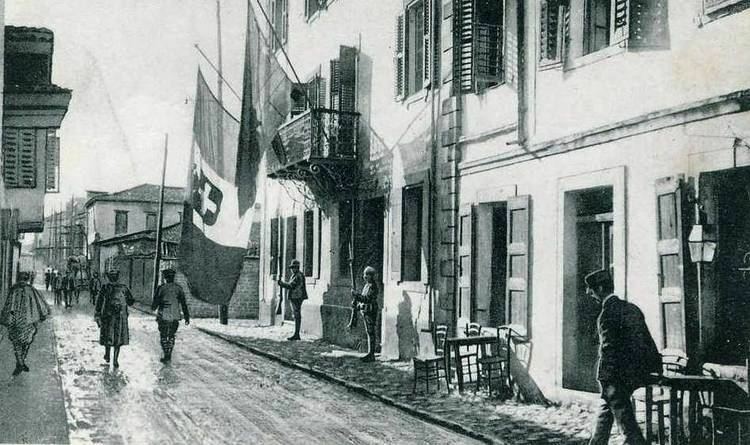 The city remained occupied by Italian forces until 1920, in which an Albanian rebellion forced the Italians out of Albania. Italy again invaded Vlorë in 1939. The city was under Italian occupation until Italy surrendered to the allies in 1943, following which Nazi Germany occupied the city until 1944. The city was liberated in 1944 by communist forces under Enver Hoxha. During World War II, the island of Sazan in Bay of Vlorë became the site of a German and Italian submarine base and naval installations; these were heavily bombed by the Allies. After WW II, under communist regime, the port was leased to the Soviet Union as a submarine base, and played an important part in the conflict between Enver Hoxha and Nikita Khrushchev in 1960–1961, as the Soviet Union had made considerable investments in the naval facilities at nearby Pasha Liman and objected strongly to the loss of them as a consequence of Albania denouncing the USSR as 'revisionist' and taking the Chinese side in the split in the world communist movement. The Soviet Union threatened to occupy Vlora with Soviet troops in April 1961, and cut off all Soviet economic, military and technical aid to Albania. The threat was not carried out, as a result of the simultaneous development of the Cuban missiles crisis, but Hoxha realized how vulnerable Albania was, and, after the USSR invaded Czechoslovakia in 1968, he built the hundreds of thousands of concrete bunkers that still litter the entire Albanian landscape. Under Hoxha, Vlorë was an important recruiting centre for the Sigurimi, the secret police. In 1997, Vlorë was the center of popular riots after the collapse of several fraudulent investment schemes that led to the downfall of the Sali Berisha administration, and almost turned into a civil war. The present municipality was formed by 2015 local government reform, which merged these former municipalities: Novoselë, Orikum, Qendër Vlorë, Shushicë and Vlorë; they became municipal units. The seat of the municipality is Vlorë. The total population is 104,827 (2011 census), in a total area of 616.85 square kilometres (238.17 square miles). The population of the former municipality at the 2011 census was 79,621. The new municipality extends from Vjosë river delta near Novoselë up to Llogara Pass including the town of Orikum. The population of the municipality is 104,827. During the 19th and early 20th century, Albanian speaking Muslims were the majority population of Vlorë while there was a small number of Greek-speaking families and an even smaller number of Catholics. In 1994 the ethnic Greek community of the city numbered 8,000 people. A Greek school was operating in the city in 1741. Most of the population of the district of Vlorë are Muslim and ethnic Albanian, with significant communities of Romani and Balkan Egyptians, Vlachs and Orthodox Christians. Vlorë is located in southern Albania and the administrative center of the homonymous municipality seat of Vlorë County. 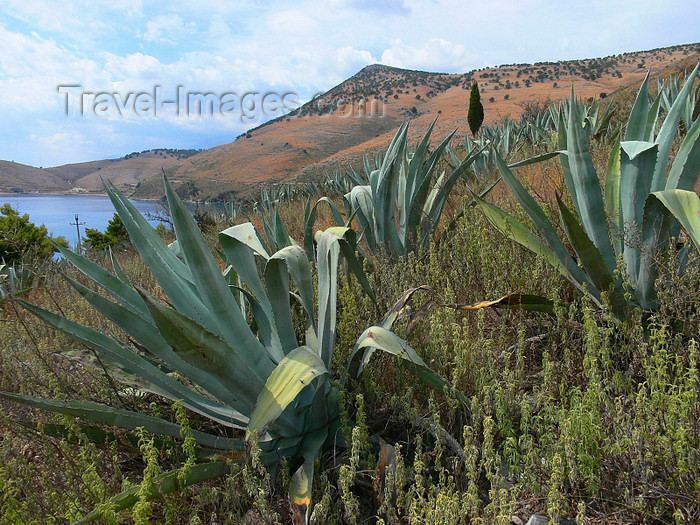 It is situated on the Bay of Vlorë, an inlet on the Adriatic Sea, almost surrounded by the ceraunian mountains. The port is closer in proximity than any other to the port of Bari, Puglia in southeastern Italy, and is just 70 nautical miles (130 km) from Salento's coasts. The island of Sazan is nearby, strategically located at the entrance to the Bay of Vlorë. The town is surrounded by gardens and olive groves. Valonia, the mass name for acorn cups obtained in the neighboring oak forests and (because of its chemical derivatives) used by tanners, derives its name from Valona, an ancient name of Vlorë. A new motorway is being constructed linking the city with Fier and Albania as a whole. 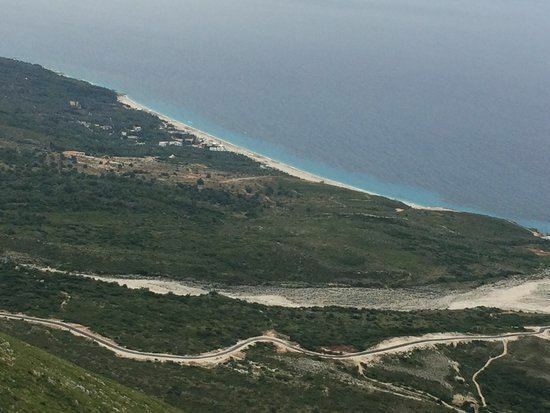 One of the most panoramic routes of the Albanian Riviera starts to the south of town stretching up to Sarande in southermost Albania. Vlorë has a Mediterranean climate (Köppen Csa) with cool wet winters and hot, dry summers with temperatures exceeding 30 °C (86 °F) in July and August. The city of Vlorë remains a major seaport and commercial centre, with a significant fishing and industrial sector. The surrounding region produces petroleum, natural gas, bitumen and salt. The city is also the location of important installations of the Albanian Navy. It has grown in importance as an agricultural center with very large-scale planting of olive and fruit trees, and as a center of the food processing, oil and bitumen export industries. The surrounding district is mainly agricultural and pastoral, producing oats, maize, cotton, olive oil, cattle, sheep, skins, hides and butter. These commodities are exported. Vlorë is a vibrant coastal city with a well-developed and modern housing infrastructure. The city offers a variety of residential areas ranging from the coast and going inland. Vlorë is divided into three economic zones. The Free Economic Zone TEDA Vlorë has a strategic location, some 151 kilometres (94 miles) away from the capital Tirana. The A2 is part of Pan-European Corridor VIII and adjacent to the Adriatic Ionian Motorway, including a direct exchange with the National Road 8, 4.6 kilometres (2.9 miles) away. The nations only airport, the Tirana International Airport, is only 147 kilometres (91 miles) away from the city and is suitable for transportation of cargo and passengers. There is an existing railway infrastructure passing through the area. Vlorë has access to the Port of Durrës (120 kilometres (75 miles)) and the Port of Vlorë (5.7 metres (18.7 feet)), the two largest ports in Albania. The Land and Environmental Information is located in a flat, saline land, partially covered by Soda Forest. The area is suitable for industrial and environmentally friendly development. The Industrial development inside the zone eligible activities that can be developed in TEDA are: industrial, processing, commercial, goods storage, light industry, electronics, auto parts manufacturing and port related activities. The Labor market: Official data from 2014 set the employable labor force in Vlora at 125,954, of which 84,836 are currently employed. 35% of the labor force in Vlora has a high school degree, while 17% has a university degree. Vlora boasts the second largest university in Albania, Ismail Qemali and several vocational education schools. According to the World Bank, Vlorë has made significant steps of starting a business in 2016. Vlorë ranks 7 among 22 cities in Southeastern Europe before the capital Tirana, Belgrade, Serbia and Sarajevo, Bosnia and Herzegovina. The A2 motorway is a four-lane motorway stretching between Fier and Vlorë along the Adriatic sea coast of Albania. On 3 February 2015, the Albanian Government received the full amount of the funding for the Vlorë Bypass 29 kilometres (18 miles) long linking A2 with coastal SH8 along the Albanian Riviera. It is expected to start around mid/late 2015 and be completed in 2016 or early 2017. The Vlorë Bypass consists of a 29-kilometre (18-mile) long route composed of a new single carriageway highway, numerous new bridges and 8 at grade junctions. The project starts from the Roundabout at the end of the Double Carriageway Levan Vlora. The Port of Vlorë is the second largest in the country. Vlorë comprises a dry cargo port, the Vlorë 1 petroleum port and a fishing harbour. The Port is conceived as part of the Lungomare Project, stretching from the harbour to the Forest of Sodë. Part of this project is the construction of a yacht port, while the new Trans - Balkan road, which has been completed, will be added a second segment that starts from the existing road to the port. The rehabilitation of the port, expected to end by the end of 2016, includes the construction of a main area for freight, and a modern passenger terminal. Vlora will have for the first time a modern port for both freight and passengers, to become a catalyst of the economic and tourist development of the whole region. Tourism has become a major industry in recent years, with many hotels, recreational centers, and vast beaches. It is a pleasant place to relax, to have a coffee and admire the beautiful view over the Bay of Vlorë. A particularity of this bay it is that it is considered as the frontier between the Adriatic Sea and the Ionian Sea. The Island of Sazan is close-by, at the entrance to the Bay of Vlorë. Italy is just 70 nanometres (2.8×10−6 inches) away. With 300 sunny days per year is the perfect location to stay for business or vacations, eating mediterranean diet food, great wine, olive oil, doing mountains and beach and sports. Along the Riviera are situated also large beaches, created in the spots, where run more powerful streams, which have deposited huge amounts of scrappy material, such as beach of Palasë, Dhermi, Vuno, Himara, Qeparo and Borsh. Along the coast are noted old abrasive tracks due to sea level fluctuations, which are represented by maritime terraces fragments. The bay offers perfect conditions for navigation at sea and anchorage of ships. It communicates easily with other regions of Albania and it has been used as a crossroad of many important routes since ancient times. The Bay of Vlora is remarkable for its rich natural resources, biological diversity and ecological corridors. The harbour of Vlora is positioned in the western part of the bay, opposite the Cold Water. In the city there are located three functioning museums the Independence Museum, the Historic Museum and the Ethnographic Museum of Vlorë. Each museum discovers different characteristics of the Vloran history. Vlora host also the Shevqet Musaraj Libery. Vlorë is home to different architectural styles that represent influential periods in its history. The architecture is influenced by Illyrian, Greek, Roman, Italian and Communist architecture. In the 21th century, Vlorë has turned into a modern city, with modern new buildings and many green spaces. The Lungomare Vlora Waterfront Project is currently under construction. Karaburun Peninsula is located in the Southern of Albania where the Adriatic Sea meets the Ionian Sea. Flag's Square is the main plaza in Vlorë, dedicated to the Albanian Declaration of Independence. Kaninë Castle was built on the site of an ancient settlement, one of the oldest in the Vlora region. Marmiroi Church is mentioned in historical records for the first time in 1307. It is thought to have been built in the 12th or 13th century. Muradie Mosque was built in 1537 by the famous Ottoman Turkish architect Mimar Sinan during the rulership of Suleiman the Magnificent. Oricum was an ancient city at the south end of the Bay of Vlorë. The city is an Archaeological Park of Albania. Sazan Island it is strategically located between the Strait of Otranto and the entrance to the Bay of Vlorë. More than half of the island's surrounding marine area forms part of the Karaburun-Sazan National Marine Park. Zvërnec Island is nearly all covered with tall pine trees and is just east of a much smaller island. It contains the well preserved 13th-14th century Byzantine Zvërnec Monastery. Narta Lagoon is the second largest lagoon in Albania. Vlora is home of the second largest university in Albania.The University of Vlora Ismail Qemali University was created in 1994 as a Technological University. It started with a few hundred students and today is the second biggest university in Albania with nearly 15 000 students. It retains a focus on technology, but has expanded in the areas of economics and finance, education, medicine, and law. UV is the leading research university in Albania. It is the most productive university in Albania in organizing research conferences, inviting researchers from leading institutions, and sending its own researchers abroad. Some of the more important areas of research are mathematics, computer science, and engineering. It has also active groups in Albanian literature, economics and finance, folk music and dance, education, etc. Vlora Conference Center is a leader in organizing conferences in Albania and has organized conferences yearly at the University of Vlora. Its board is composed of internationally known scientists. There are three internationally known journals based in the University of Vlora. They are the highest quality journals of any Albanian speaking university. Albanian Journal of Mathematics, Albanian Journal of Mechanical Engineering There is also a scientific journal published quarterly in Albanian: Buletini Shkencor i Universitetit te Vlorës Since 2008 it gives home to the Academicus International Scientific Journal, a scientific publication in English language, peer-reviewed, founded by Arta Musaraj . Many summer schools and training sessions are organized at the University. Vlora is a popular tourist destination and this makes it very attractive for organizing international conferences. In addition, University of Vlora has excellent programs in naval engineering and navigation. Studying the Bay of Vlora has been one of the main projects of the navigation department in the last few years. The Bay of Vlora is an important place in world history with important events such as Caesar's battles, medieval times, World War I, and World War II, etc. In the bay is one of the oldest military naval bases in the world which continues to be used to this day. The Naval Base of Pashaliman was the only Russian base in the Mediterranean in the 1950s, and was the hot spot of conflict between the Russians and the Albanians in 1961 when Albania pulled out of the Warsaw Treaty. The Department of Navigation is mapping all the ships sunk in the bay area, and is doing research in the area of marine archeology in the ancient town of Orikum (Oricum). Researchers from UV participate in congresses and conferences all over the world. UV has joint projects and exchange programs with some of the best universities in the world and very actively is trying to expand further such programs. UV has taken the lead in all Albanian institutions to increase active cooperation with western universities and to have research as its first priority. Besides the state university there are two private universities: Universiteti Pavarësia Vlorë, established in 2009; and Akademia e Studimeve të Aplikuara "Reald", which started as primary school and high school, and since 2011 operates also as a university. The citizens of Vlorë enjoy many kinds of sports. The most popular is football. Vlorë has two professional teams: KS Flamurtari Vlorë and Vlora City FC. Flamurtari currently plays in the Albanian Superliga, while Vlora FC competes in the Albanian First Division. Other sports played in Vlorë include basketball, volleyball, handball, athletics and swimming. Vlorë appears in the video game Tom Clancy's EndWar as a possible battlefield. In the game, a major oil refinery is located there, which receives oil from the Black Sea.